The Oxford Specialist Handbooks series provides readers with clear, concise information on all that is needed to successfully train in the medical sub-specialties. 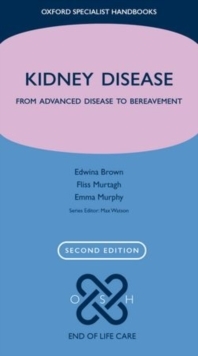 Each book gives an overview of clearly defined procedures, skills, guidelines, and technologies and provides practical tips and case studies to supplement hands-on experience. Where appropriate, each book complements the revised curriculum as developed by the Specialist Advisory Committees. Dementia is a growing issue, exacerbated by improvements in health care which have led to an ageing population; currently three quarters of a million people suffer from dementia in the UK, and this is expected to rise to 1.8 million by 2050. 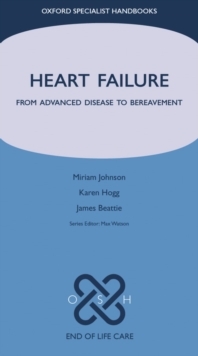 This book concentrates on advanced disease and addresses issues such as pain management, decision-making, spiritual needs, communication, the Mental Health Capacity Act, dementia in the younger patient, and the carer's perspective. 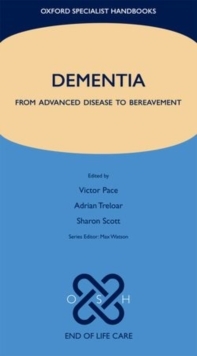 Written by specialists, this book will be invaluable for doctors and nurses involved in palliative medicine, geriatrics, and old-age psychiatry, and the generalist who treats the patient with dementia.